As you already know very well, in my experience and day by day work I’m also developing application for the Enterprise Mobile Devices. In my (long) story I practically used every kind of device with a version of Windows Mobile, Pocket PC, Windows CE etc. OS. But the longest experience I’ve done is with a specific brand, that is also one of the biggest and more important on the market: Zebra (more often known as Symbol or Symbol Motorola, during the years it change name a couple of time). In the last year many brands continued to use Windows Embedded Handheld 8 and 8.1 powered devices but till now Zebra don’t officially announce devices wit “our” OS. 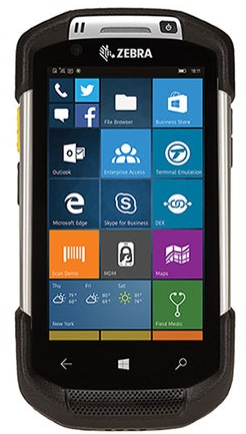 Today I accidentally discovered that Zebra has now a Windows 10 IoT Enterprise device available: the TC70! The device is on the market from some time with an Android distribution, but recently (October 2016) there’s also a new version powered by WIndows 10. It’s the version of windows related to WIndows Phone/ Windows 10 Mobile in the version IoT Enterprise (specific SKU for this type of devices). I’ve immediately asked my supplier to know the price of the device, but for now I don’t reach this information. I’ll update this post when more news will be available. What to say next? It’s arrived!!!!! !